A perceptive, sensitive history of both basketball and desegregation in the late 1960s. Perry Wallace, Jr., was a quiet, respectful student from Nashville, Tenn., who excelled at school (especially in math and science), at playing the trumpet and on the basketball court. Though not a natural leader or revolutionary, when recruited by schools across the nation, he reluctantly “made the decision to attend Vanderbilt University not because of the fact that he would be a trailblazer, but in spite of it.” When he enrolled in 1966, Wallace became the first African American to play in the Southeastern Conference, thus desegregating Deep South athletics. At Vanderbilt, he played in the same gym where Stokely Carmichael and Martin Luther King, Jr., participated in a speakers’ symposium during Wallace’s freshman year. In his four years at “the Harvard of the South,” Wallace was harassed, spat upon, called names and assaulted on the court in a series of “fouls” that went uncalled. (His coach told him to “learn to duck.”) The away games in Mississippi were the worst, but even at Vanderbilt his classmates publicly ignored him, yet still cheered him on the court and furtively asked for his help with their homework. 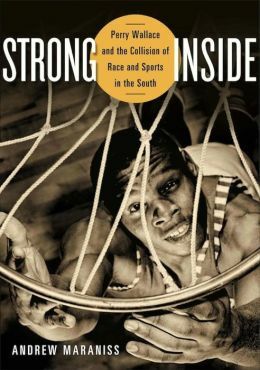 Andrew Maraniss’s Strong Inside: Perry Wallace and the Collision of Race and Sports in the South deftly reveals the nuances of Wallace’s childhood, early education, groundbreaking career of torments and triumphs at Vanderbilt and the exceptional, well-rounded life that followed. A Vanderbilt alumnus, Maraniss shows great compassion and insight with a detailed narrative that is both broad and deep, covering the civil rights movement and college basketball with equal authority. Wallace’s story is powerfully moving and deservedly, beautifully told. This review originally ran in the March 17, 2015 issue of Shelf Awareness for Readers. To subscribe, click here, and you’ll receive two issues per week of book reviews and other bookish fun! Rating: 8 fouls not called. I am so glad you left me this book so I would eventually read it, now three years later. I was in high school becoming obsessed with basketball around the time Wallace became the first black athlete in the SEC, playing basketball for Vanderbilt, a university that would later accept my application although I attended elsewhere. I was entirely unaware of Wallace at the time, but I knew most of the prominent players & teams that comprised Wallace’s sports world. I was also ignorant of the more significant social struggle that defined his life, which despite other proximities I learned largely in retrospect; that’s an education that continues today with the help of narratives like this one. His story is iconic in so many ways, and it is a gift that Moraniss discerned this & spent 8 years preparing to tell it: a boy raised amidst Nashville’s version of the civil rights movement, with maturity enough to see beyond his social place, and beyond just sports, to recognize potential both in higher education and his prospect as a pioneer during a nation’s essential historical moment. The result is singular insight into the civil rights movement, from the intimate perspective of a special person at very specific time & place. As such, this book reminds us how capricious history can be as it consists of stories we choose to preserve and honor. Thousands of people contributed to this era’s history; few are as compelling & admirable as Perry Wallace, from start to finish – or as thoughtfully captured as Moraniss has done here. One must wonder, how many other such strands of history go missing?